ArmiesArmy is in their final 4 days on Kickstarter. If you want to get in on the action, now's the time. 4 days to go and I have an amazing 126% completed! More importantly I am now very near another stretch goal, the support weapons squad. This will consist of a Sniper/ATR team , a AA missile and a heavy ATGM team. Following that I will have the Heavy support teams. I appreciate all the fantastic support I have had. 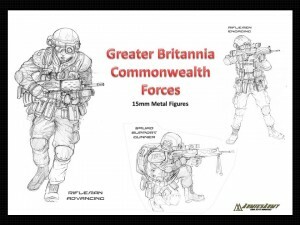 With a little more push, I will have a great foundation for the Greater Britannia Commonwealth Brit forces!